Summer is here and we are off and running in our attempt to find ways each week to serve God’s people through acts of service in the church and the community. Because we are starting a new season, I have found myself reflecting on why Hands and Feet was started in the first place and what we hope to become…Hands and Feet began as a small attempt to get out of our comfort zones and out of our routines, to find a space where the entire body, from the youngest to the oldest, could come together as one and worship God through serving His people. Webster’s defines worship as “honoring with extravagant love and extreme submission”. And when I think of how we can honor God with extravagant love and extreme submission, I am reminded of Jesus’ command to Peter in John 21:15-17 when he asked “Simon son of John, do you love me more than these?” when Simon Peter responded “Yes Lord, you know that I love you” Jesus told him not just once, but three times “Feed my sheep”. If we can find a place, where we come eye to eye with God’s people, with an understanding that we are all broken and human too, and we walk alongside them, and they do the same for us, my heart knows that this glorifies our good and beautiful God. So we start here, and what if, in this place, relationships are built, bridges are made and we are able not only to see those we come to serve, but each other too, the way that Jesus sees us. If young and old and everyone in between comes to this common ground, where we aren’t our titles or our statuses in the world, but children of God in worship together, then we are honoring our God with extravagant love and extreme submission by loving His people. You see, at our church, we love. 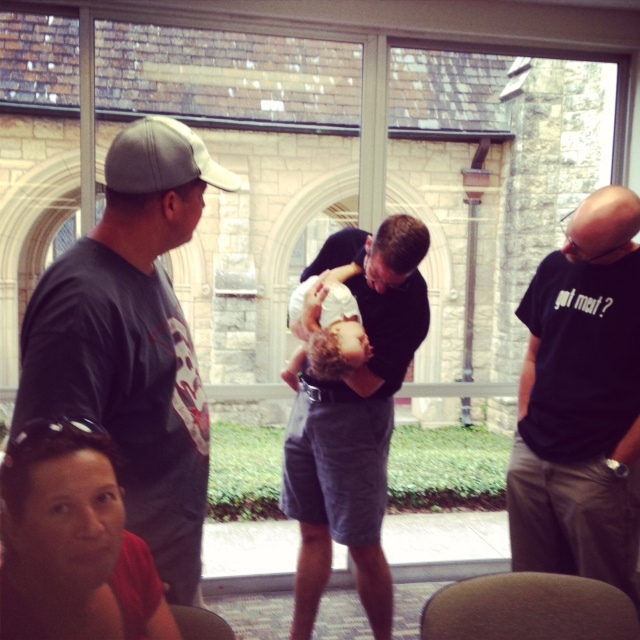 If there is only one thing that our church is exceptional at, it is loving people. This space we dream of as Hands and Feet, is the space where we take this gift that the Spirit has blessed our body with, this gift of loving, and we would move together, as one body, like an unstoppable force of love through our world. We will worship God together, our children, our teens, our women, our men, we will honor our God with extravagant love and extreme submission by loving His people. We will start by joining hands with Pastor Jim down at Strong Foundation this week. Our teens will be working all week to build a new fence for their property among other things. Wednesday night we will all join together at 6pm to eat dinner with the families who live at Strong Foundation and we will follow that with “Kidztime” where we will have an opportunity to play and care for the children of Strong Foundation so that their parents can attend Bible class. Our prayer is that this Wednesday night our unstoppable love will be in full force and we need all the hands and feet to join us!!! “For I was hungry and you gave me something to eat, I was thirsty and you gave me something to drink, I was a stranger and you invited me in” Matthew 25:35. This past week, was an incredible whirlwind of blessings, a kind of week where you walk through life, sort of hovering over your body, trying to take it all in, trying to take in every bit of good that is around you, above your body to get a better viewpoint of the people you call friends, the work they are doing for the kingdom, the kind of week that I believe can be summed up with one question: “Do you like Elmo?”. Try to stay with me and I’ll give you my feeble attempt to bless God for the way He has moved through our community this week. 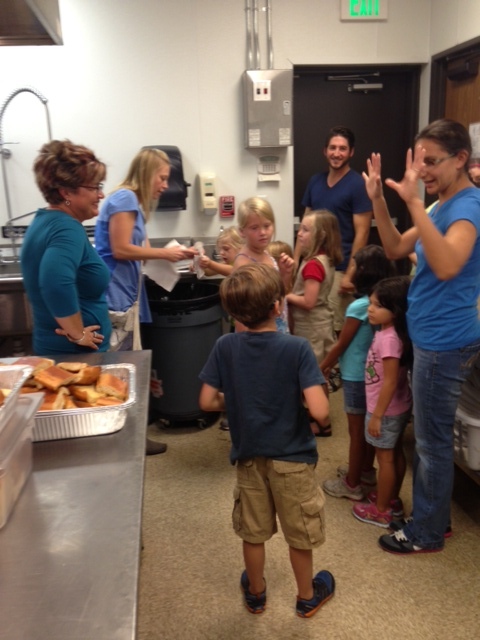 Hands and Feet was blessed to serve at Church Under the Bridge Thursday evening for their dinner and worship service. A group of us went in with our desserts and salad and were set to serve. Our beautiful children even spent time weeding through the salad to find any brown pieces or break parts that were too big and of course in a way that only children could, they loved it. When we walked into worship, they just started “Manifesto” by The City Harmonic http://www.youtube.com/watch?v=o_6JQDsbtlM. This song is powerful on its own, but add a room full of people, it was estimated around 180 homeless, who cling so tightly to Jesus it is tangible, singing it at the top of their lungs, crying it out to God…you can’t imagine that feeling without being in that sanctuary. 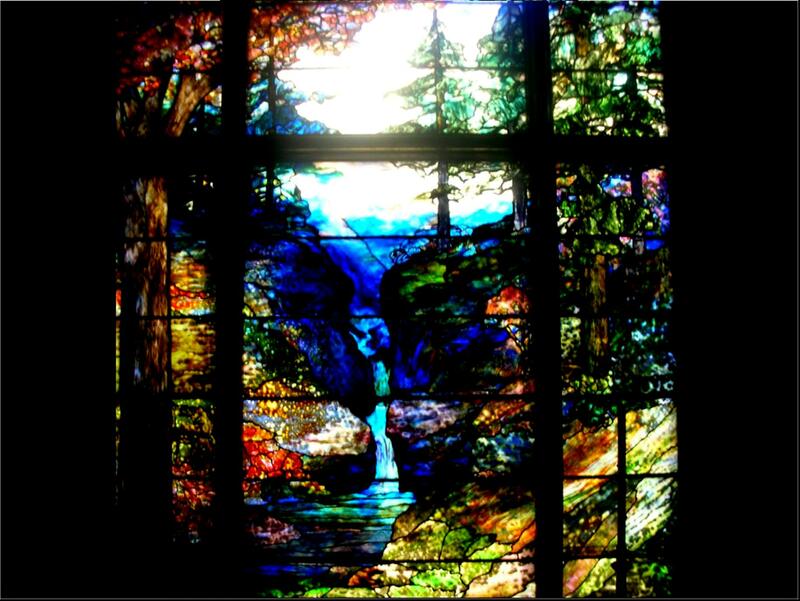 And we begin the journey, yet again, with God…blessing us who come to bless. A manifesto is defined as a public declaration of policy and aims. 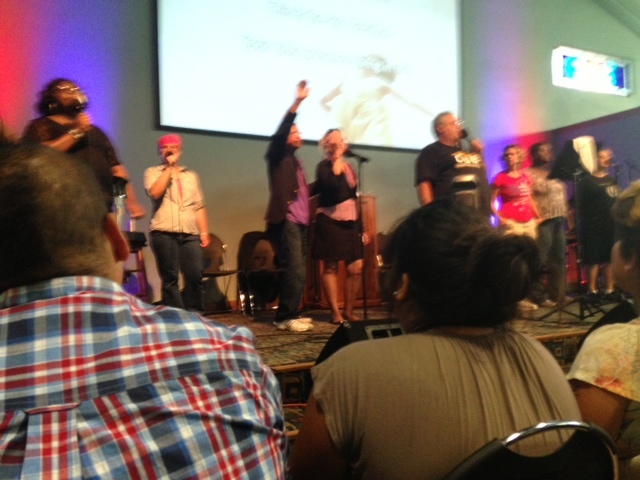 Thursday night these people were declaring to the Lord, with all everything that they had that they believed. We were energized, our souls were filled and ready to serve. 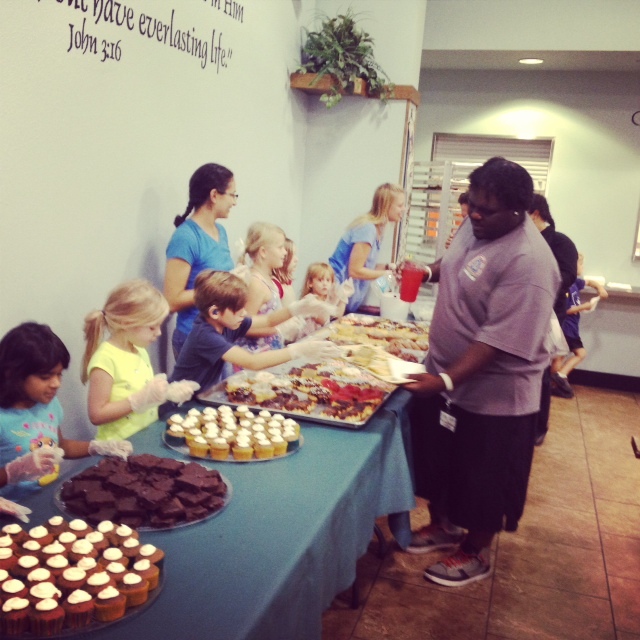 Our children waited patiently by the dessert table ready to share sweets and smiles with everyone who came. We filled trays, chatted and laughed with the guests. After a hundred or so people, I looked up and there he was, Raymundo…of all the people I could have seen that night, it was him…the man that I wrote about in my first post, I hadn’t seen him since and there he was…big toothless smile and he said “I remember you”…and in his eyes, once again, I saw Him…tears filled my eyes and I smiled and silently thanked God for being there. 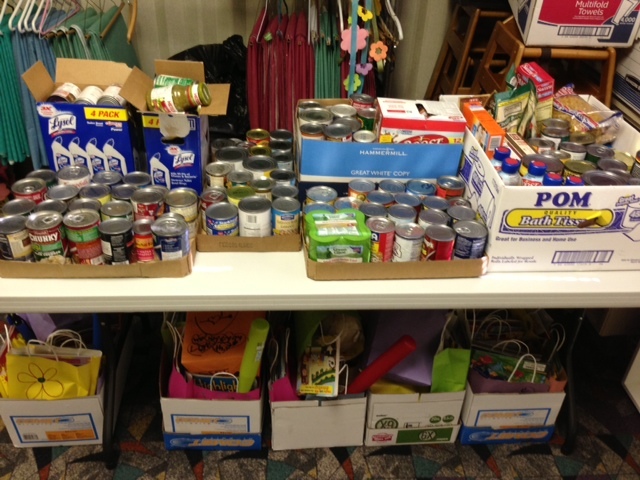 Our community came together, with other churches, friends from outside our circle and we served together. 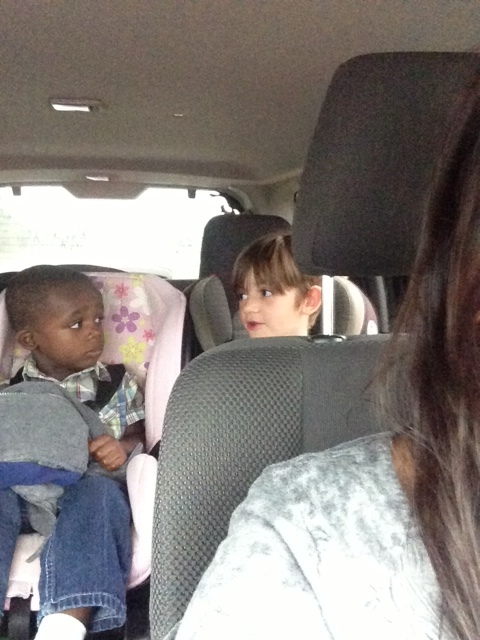 On the car ride home my oldest (6) said “Can we please go back to that place more times?”. Sunday Supper time arrived and this month Scott, Mike, Derrik, Todd, Jordan, Steve, Janet, Suzan, and giant crew of helpers, held a Fall Festival for everyone who attended. I walked through the halls of our church where people were eating, laughing, face painting, pumpkin decorating, giving hair cuts and all I could think was “THIS is the CHURCH”…THIS is the BRIDE…a community coming together, from all walks of life to break bread. The wisdom of a child. The Elmo boots were the very last thing in my mind while I was trying to get this terrified little boy reconnected with his momma as quickly as possible. Suddenly I hear “YES I LOVE ELMO!” and it’s Ryan, and I see a giant smile in my rearview mirror! And next to that smile, I see the face of my son. I have NEVER been more proud to be his momma than that moment. A question, so simple, broke the barrier. Walls fell down. And then he asked again, “How old are you?” “2” Ryan said. “Momma! He’s 2! we can give HIM my BOOTS!”. In one small conversation, my six-year-old child managed to cut right to the point. He found common ground, he saw a child hurting and he found something to make him smile…not complicated, not drawn out, not patronizing. He asked one question that he would ask a friend and he built a relationship. In one weekend life lessons were taught by the least of these. I dare say the greatest lessons in LIFE were taught by children and the poor. Cling to God when there is nothing else to hold on to…Cling to God when there is everything else to hold on to. In your greatest feats and your saddest defeats. Worship Him with YOUR LIFE. I watched people, who by the world’s standards, have NOTHING, singing with THEIR LIFE “We are free He died and lives again!”. Have empathy and build relationship. Find someone else’s Elmo. Find your common ground. Be present with them and don’t “help”, build. I learned this lesson from a six-year-old boy. And when you think that you don’t have anything to give…give EVERYTHING-like a beautiful momma and dear friend of mine who has four young children and somehow managed to find the time to clothe a man, feed him, give him a place to sleep and help him on the road to sustainable employment…oh and did I mention she has 4 kids!! We can do this together. We can build bridges and bridge gaps and relationships with each other and change the world together, no matter where we are or how much is on our plate, because there are people whose plates are empty and we have to start moving. As you can see from the picture of Reese and her best friend Reagan, we have had some very busy hands and feet so far this summer. So busy, that we haven’t updated all of you on all of our work-so here we go! 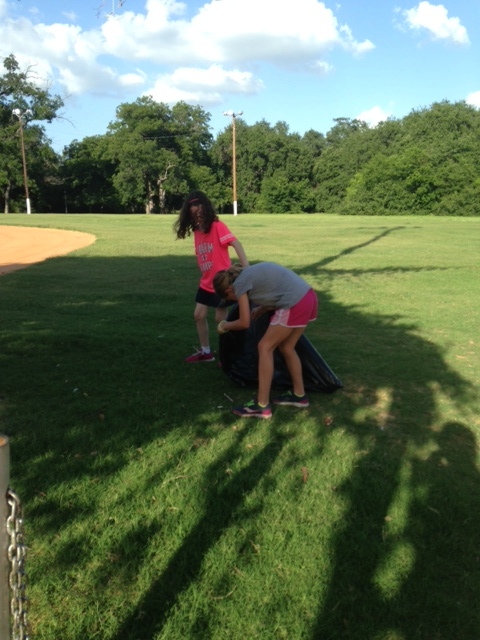 We started at Brackenridge Park, where we spent a few hours removing litter, sweeping, and removing graffiti and litter from the incredible hidden gem of a playscape in the far corner of the park. Our team worked HARD that night and was rewarded by delicious homemade cookies from our friend and supporter Mildred and refreshing Hubert’s Lemonade! This project was teamwork at it’s finest, as you can see above and thanks to our congregation at Sunset Ridge we were able to hand out 150 bottles of ice cold water to runners and people at the park. And just when I thought that this was more community service than ministry, a man asked for a bottle of water as I was pulling the coolers down the sidewalk. This particular man, was a regular guest of our church’s Sunday Supper and we are reminded that ministry can happen anywhere, anytime, when you go out into the world with Jesus by your side and in your heart. The following week Chris and Kelsey organized an INCREDIBLE night with the teens and kids. 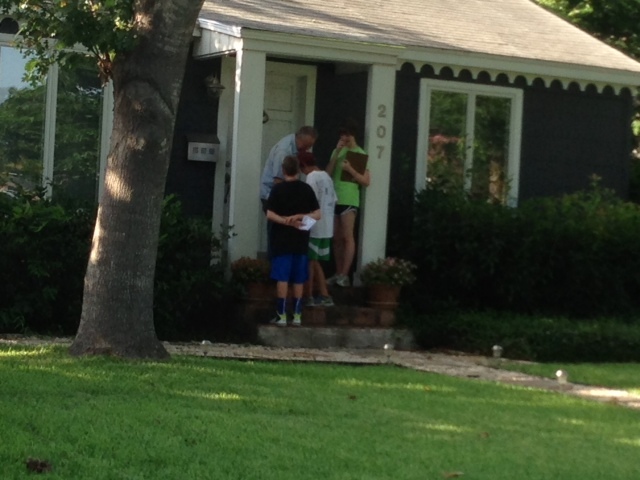 They went door to door around the neighborhood looking for canned goods to be donated to our Sunday Supper guests. The coolest part of the evening, was listening to the kids talk about their best and worst experiences of the night. Beautiful Sarah Stone lit up the room when she talked about the man who didn’t have anything to offer but promised he would go to HEB and bring some things to the church!!!! The next day, the man did exactly as he promised. Our group made bags for the homeless to keep in our cars, so that our ministry doesn’t stop at Wednesday night or Sunday morning, but can make an impact anytime we leave the house. We were able to provide pickups for goods that people no longer wanted for the month, leading us up to our Church Wide Garage Sale, with proceeds going directly to Hands and Feet ministries. Our Sunday Supper friend, Leo, mentioned last month that he used to give haircuts until someone stole his clipper set. 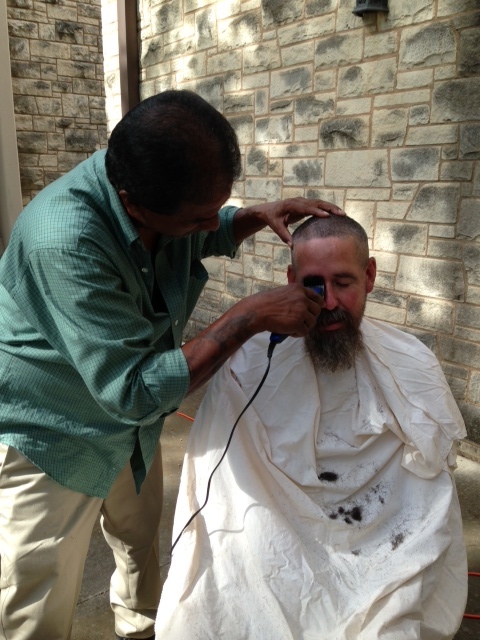 Brett and Jenny listened to him and provided a set of clippers so that he could give haircuts to our homeless guests and he could know that he is important, that he is heard and what he says matters, isn’t that what we all want? One of our guests said that he could really use some shoes, and because Sunset Ridge has a BIG heart, our shoe donations were flooding the Fellowship Hall. We were able to give shoes to almost all of the guests and still have some leftover…and again we are reminded of the fish and loaves. 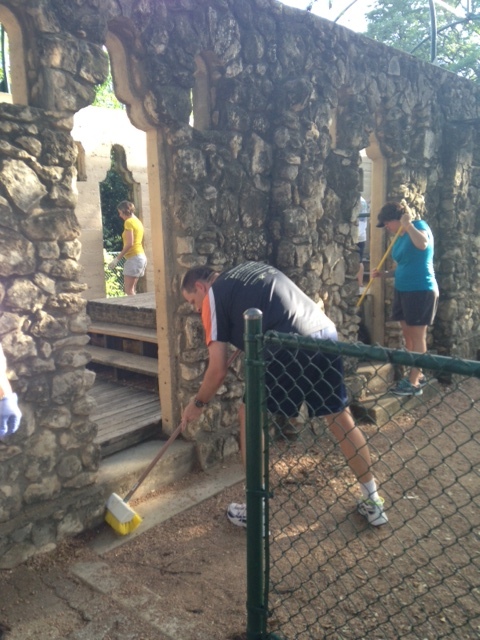 Last week a group of us were able to serve at the Church Under the Bridge. 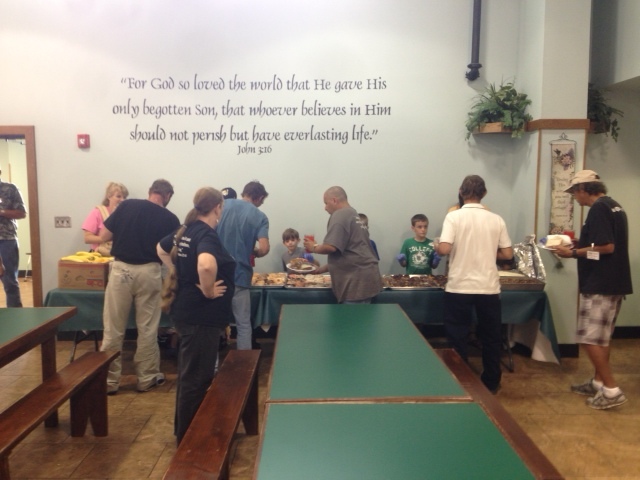 We were able to attend worship with the homeless guests, serve them food and drinks and our kids had the joy of serving donuts for dessert. Let me tell you, these kids are service professionals now! They served donuts and smiled and the guests loved their presence. And during worship we sang “Your love never fails” together. We witnessed a group of people smiling a worshiping together, singing arms raised to the heavens “You make ALL things work together for MY good, your love NEVER fails”. This group, according to the standards of the world, has nothing. And in that moment we were able to see what it truly means to have it all. We entered the building to try to be a blessing and we left truly blessed. We will use the money we’ve raised to return to Church Under the Bridge to cook together, serve together and worship together. Our group served to set up for vacation bible school, which was so appropriately themed “Love God, Love Neighbors” with a theme of serving our families, our community, our neighbors and Jesus. Our church knows what it means to love and to serve and that love is growing. This is a group of people that don’t hesitate to respond to a need and most of the time you will find that you need to find more work for everyone to do because so many show up. 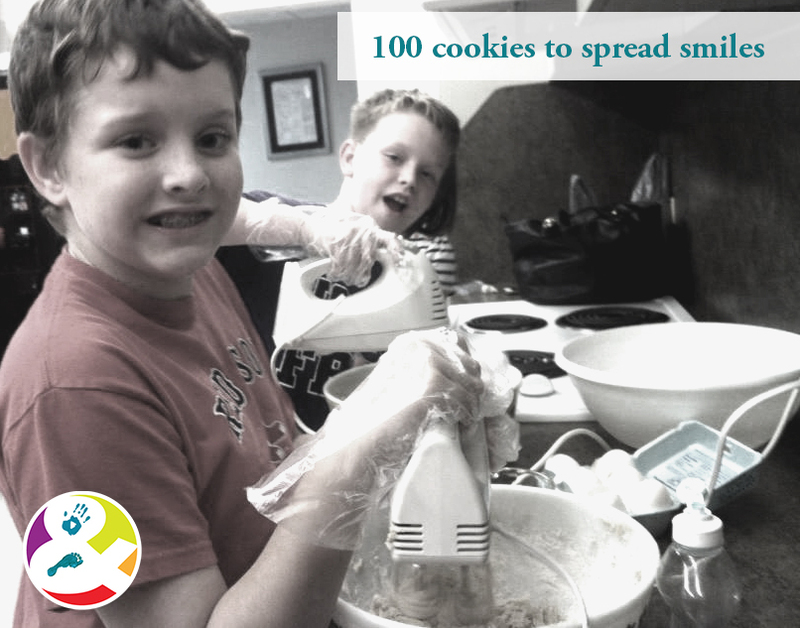 When I made a call last Saturday for Mildred to host a muffin baking session with our kids, to bless CAM ministries with breakfast, not only did she respond with joy, she shortened a trip to come home to help! These are the kinds of people that God has blessed us with and these are the Hands and Feet of Jesus working in our world. 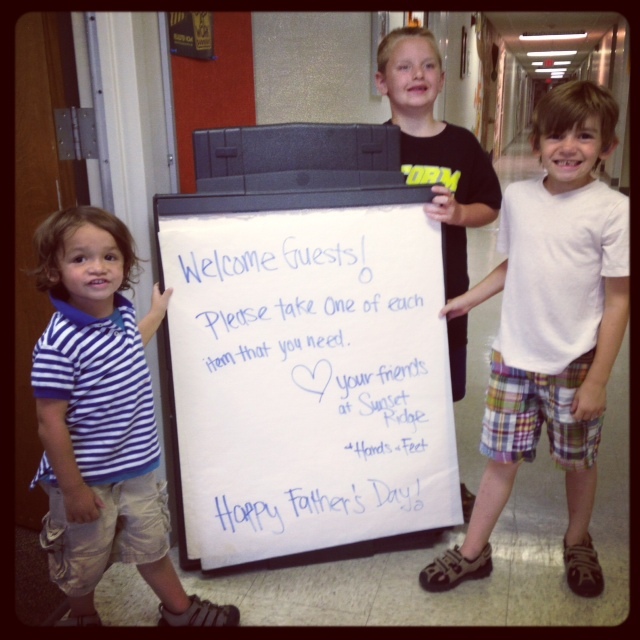 We are so grateful to be a part of this small church with the BIG heart. We have learned, over everything else, that God is always there, He takes whatever small, human attempt we make to glorify His name and turns it into something incredible, every time. Remember that next time you think about doing one thing to brighten someone’s day…you never know what it means to that person…they might have just prayed to God that YOU would show up. What DOES it really mean to be the Hands and Feet of Jesus??? When the ideas for a group of people doing service projects started flowing…it was hard to get them to stop. How can we help? How can we change our world around us? What will we NAME our group…a little voice said over and over “hands and feet…hands and feet” and it made sense-we want to BE the hands and the feet of Jesus Christ to anyone and everyone we can. Have you ever thought you really KNEW something-oh yeah, I know what that means…be the hands and feet, make sandwiches for starving people, bake cookies with my children to hand out to make someone smile, get on your hands and knees and paint the church parking lot so that money can be used for something meaningful. Sure, we’ve got this. An amazing group of men host an event once a month called the Sunday Supper. This is a free dinner open to anyone and geared towards providing a hot meal to the homeless in the area. 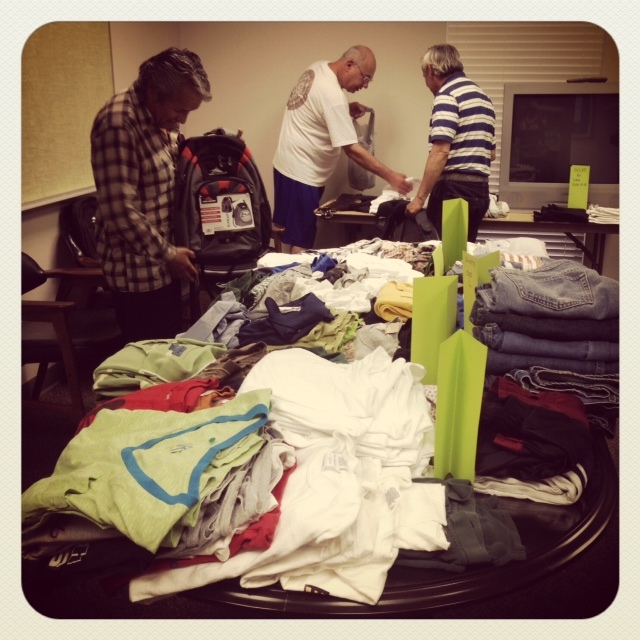 Hands and Feet wanted to support this mission for the men that attend this month, so we held a clothing drive. This morning we confessed our concern to each other, because well, we just didn’t pull that much clothing in. We had some great, brand new backpacks, a handful of soap and 20 or so t-shirts, hats and socks. And we are the disciples, and we know the stories and we witness the miracles over and over and we still don’t get it. We set the small table with goods we have and when we return an hour and a half later, our goods haven’t doubled, tripled, but quadrupled. 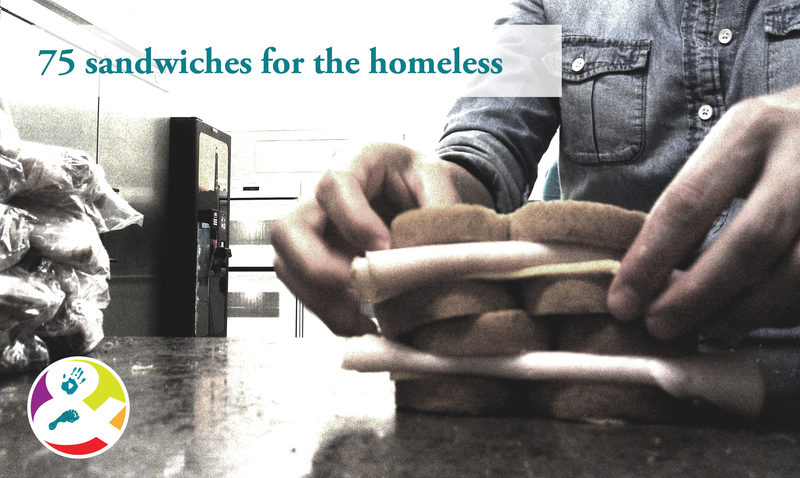 We have jeans, belts, deodorant, toothbrushes, razors…we have two small loaves of bread and a couple of fish that have turned out to be enough to feed 5,000 and we have leftovers. And Jesus whispers “I am here.” And we doubted. Men come in for dinner and are asked to come and pick out some things that they need, whatever they need. And I meet Raymundo. His backpack is broken, he needs a new belt, a pair of socks, a shirt, a razor, a bottle of water…I’m from my privileged, top of the food chain perspective, and I offer “Ray, take a couple of shirts, what about an extra bottle of water, another ball cap?” Ray looks me in the eyes and says “I only take what I need ma’am” and I still don’t get it, I think that he’s being polite, and I push…and he looks at me again and says “I can only take what I can carry, ma’am”. My heart stops and I can hardly catch my breath and even as I write this I can’t fight back the tears…”I can only take what I can carry.” This is the most sobering moment of my life. And Ray has blessed me in ways in this moment that will change me forever. He is so grateful, says thank you over and over, but it is me who is grateful. And He’s there again, in the eyes of Raymundo and his bright and beautiful smile. It’s something to look into the eyes of a man and see your Savior, reminding you what this is really about…it’s too much for words. A beautiful mother bounces her little girl in the hall, she talks to the mothers that come for the dinner, and she talks to them like a friend…”hands and feet”. In the fellowship hall, people eat a beautiful chicken alfredo, fresh salad, green beans, croissants, brownies, cookies made with great love and care and one of my new friends Steve, talks about practicing his trumpet in the shelter. Nicholas talks about what this warm food does for his soul…Mike, Scott, Derrik, Byron and Todd have warmed a man’s soul tonight…and He whispers… “this is hands and feet”. Across the room, I see a smile out of my dear friend and son’s soccer coach, Jeff…but this isn’t any smile, this is the smile of PURE joy, as he cradles one of the daughter’s of a man named Alfredo that comes to the Sunday Supper every month…”this is hands and feet”. Jordan makes Father’s Day cards with the children, for fathers that may have never had a Father’s Day card before…she sits WITH them…loving. Martha and Gay look women and men in the eyes when they speak to them, because they want to know them, they want them to FEEL known. I watch two different families drive men to “home” which may be a park, a street corner, or a patch of woods…and I hear Him again… “hands and feet”. Hands & Feet accomplished much last night: 75 sandwiches for homeless friends of Christian Assistance Ministry (CAM), 100 cookies for H&F children to gift to teachers and neighbors, stripes painted on a portion of the church parking lot, restock of pencils and cards in the sanctuary, and yard work. 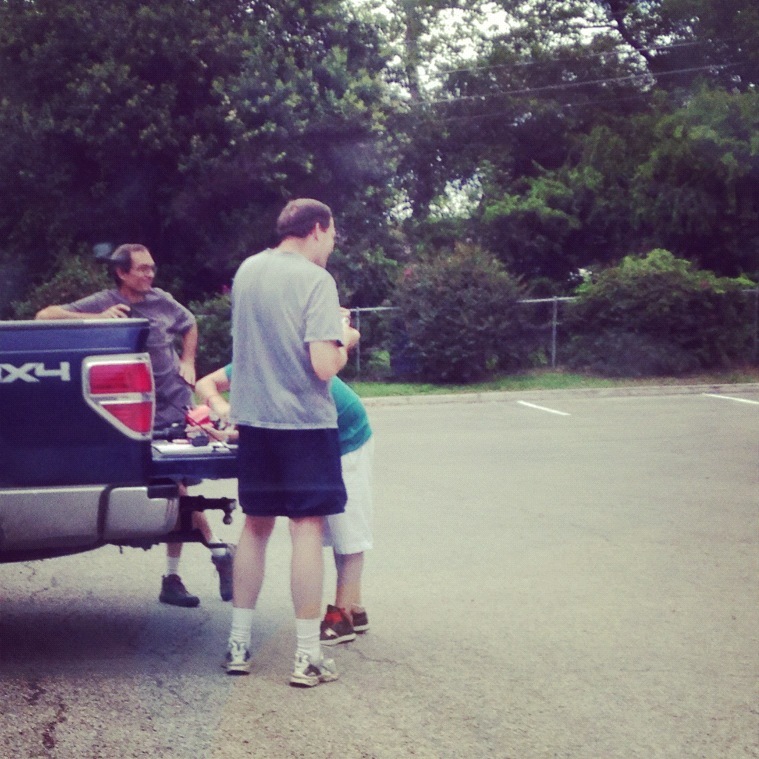 Hands & Feet is a ministry of Sunset Ridge Church of Christ dedicated to being the “hands and feet” of Jesus Christ in the San Antonio area through community outreach and service. Enter your email address to follow Hands & Feet's blog and receive notifications of new posts by email.